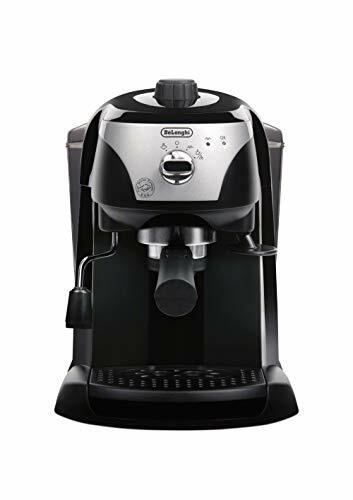 Enjoy espresso, cappuccinos, or lattes at home with this compact espresso machine. It features a 15 bar pump system to deliver a perfect cream and a swivel jet Frother to make rich, creamy foam. It also comes with a built in tamper to help pack your grounds into the filter and correctly tamp them for the optimum espresso. The water tank and drip tray are removable for easy refilling and cleaning. A. The pump is a 15 Bar pressure. Please do not ramp the coffee too hard. A. Please calibrate the machine before use. 3. After a couple of cups of coffee the pressure became 0. 4. I'm not happy with the steam process of this machine. It boils rather than steaming and foaming the milk. A. Please clean the steam wand especially the small hole that let air in and create the foam. 5. Water drips from the underside of the tank. 6. Coffee basket sticks and is difficult to turn. A. When unit is new the turning is more strong but with usage it get loosen up. Kindly review the video under the image section for set up related and cleaning instructions of Espresso Maker.